^ Dery, Mark (November 14, 2018). 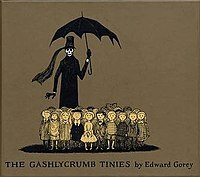 "The Birth, Death, and Long Afterlife of Edward Gorey's Gashlycrumb Tinies". Slate Magazine. Retrieved November 18, 2018. ^ Kogan, Rick. "Step inside Edward Gorey's weird, beautiful world". Chicago Tribune. Retrieved April 11, 2015. ^ Chavez, Danette. "Goreyesque Wants Your Edward Gorey-Inspired Writing and Artwork". gapersblock.com. Retrieved April 11, 2015. ^ "Goreyesque About". Goreyesque.com. Retrieved April 11, 2015. ^ "Call for submissions: Columbia College Chicago's Department of Creative Writing seeks Goreyesque work". ChicagoNow. Retrieved April 11, 2015. ^ "Selling to CTA riders, veterinary house calls and another Tea2Go". Crain's Chicago Business. February 25, 2014. Retrieved April 11, 2015. ^ "Goreyesque Issue 3". Goreyesque.com. Retrieved April 11, 2015. ^ "Goreyesque Issue 1". Goreyesque.com. Retrieved April 11, 2015. 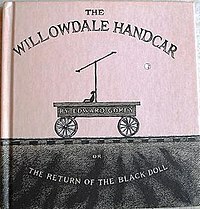 The World of Edward Gorey, Clifford Ross and Karen Wilkin, Henry N. Abrams Inc., 1996 ( ISBN 0-8109-3988-6). Interview and monograph. The Strange Case of Edward Gorey, Alexander Theroux, Fantagraphics Books, 2000 ( ISBN 1-56097-385-4). 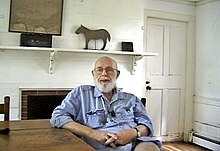 Biography and reminiscence by Theroux, a friend of Gorey. An expanded edition was published in 2011 ( ISBN 978-1-60699-384-2). Born to Be Posthumous: The Eccentric Life and Mysterious Genius of Edward Gorey, Mark Dery, Little, Brown, 2018 ( ISBN 978-0-316-18854-8). This page is based on the Wikipedia article Edward Gorey; it is used under the Creative Commons Attribution-ShareAlike 3.0 Unported License (CC-BY-SA). You may redistribute it, verbatim or modified, providing that you comply with the terms of the CC-BY-SA.